Good Lake Michigan boat, roller furling, hard dodger, NACA profile rudder, tiller steering, large cockpit with room to lay down, large lazarette lockers, flush deck -> room to live aboard, main cabin, enclosed head, v-berth, lots of storage. Old gas inboard removed, lots of storage room under the cockpit, no oil or smell in bilge. The former engine room, now sail locker has room for storage of items up to about 9 feet long, or you could add a berth under the cockpit. 6 hp four cycle Tohatsu provides plenty of power, on a sturdy Fulton Four Stroke outboard bracket, lifts motor out of water. 2 gallon day tank and 6 gallon reserve tank for outboard motor. Ports have been replaced recently, the boat is very dry, often the bilge is dusty dry, although sometimes in humid or cold weather there is condensation and there is a puddle is in the bilge. 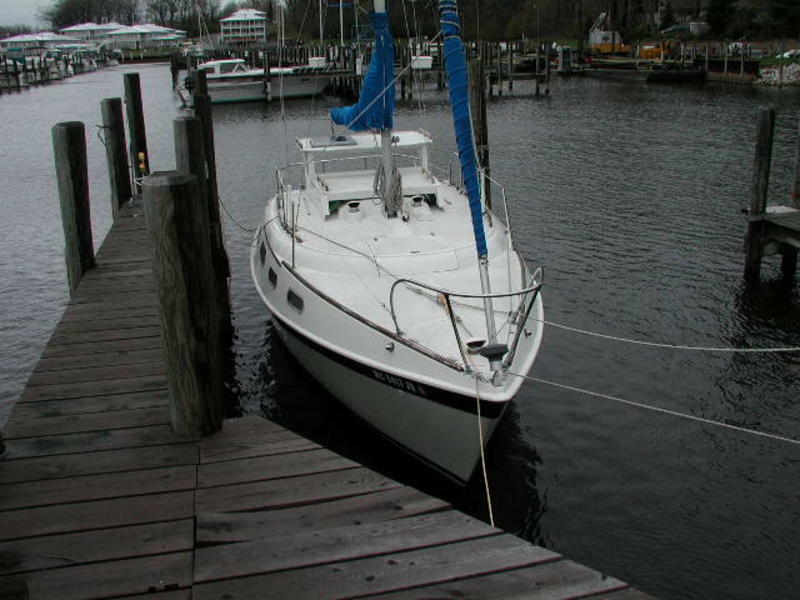 The boat handles waves well, and is very dry on deck due to high freeboard of flush deck. Large forward hatch provide good ventilation but may need some attention to make it watertight to waves. The hatch does not leak in rain or general use. The gelcoat is worn, and discolored in some parts of the deck. The topsides are decent with a few minor stains and discolorations. The hard dodger allows the hatch to remain open in light rain, in windy conditions you may want to shut the hatches. I estimate the sails as being about 15 years old. They are in good condition. Hood roller furling system. Halyards and furling line are getting old, but in usable condition. Jib and main sheets in good condition. Rigging is original, to my knowledge. You may wish to rerig, however in fresh water stainless steel rigs last a long time. Princess pressure kerosene two burner stovetop, Fab-All diesel/kerosene cabin heater (vented). The original 10 gallon water tank and foot pump are in the boat but I usually use 3 gallon jugs for better drinking water quality. Large insulated icebox, large dry storage box, storage under settees and vee berth. Storage behind settee backs. Some LED cabin lights, LED anchor light. 40W (?) solar panel on hard dodger, two marine 12V batteries (electric trolling motor type). The solar panel can keep up with cabin lighting, occasional nav lights, LED anchor light and radio use, but if you want to use a laptop every night you will want to increase the battery bank and add a solar panel. 35lb CQR anchor, 22lb Claw anchor, 3 sets of chain of about 40 foot each, two anchor rodes of about 100 some foot each, a large steel Danforth storm anchor, miscellaneous shackles. Older Autohelm tiller pilot, still working fine. Ancient vhf no longer working, I use a handheld. A number of docklines and several fenders. Portapotty with pour spout, easy to empty into a toilet or where ever, I usually do so on a daily basis. Head has sink with 3 gallon water tank and hand water pump to sink. Drawers and storage shelf in head. The head area is full width of the boat with doors to both cabin and v-berth for good privacy. This is a great boat and would be a good liveaboard, with minor improvements is ready to head down the ICW for the Bahamas, which is what I had hoped to do but life got in the way. The boat has some settee cushions that need replacement, the water tank and footpump should be replaced, and the batteries are getting old but still working. I would add a bow roller for the anchor if I were going to be anchored out every day. Some hatches and hinges are showing their age but still functioning. I love my boat but am working on other projects and have no time to use it. Someone who wants to liveaboard and travel to the Carib should pick this up and escape winter.